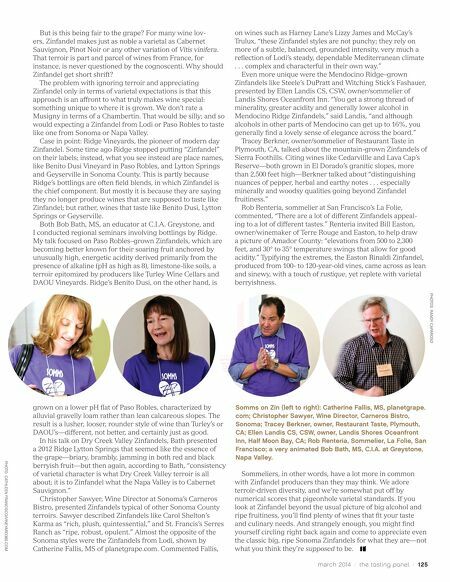 124 / the tasting panel / march 2014 Zin Sense I n seminars at the most recent Zinfandel Advocates & Producers (ZAP) Experience in San Francisco this past January, some of California's top sommeliers presented Zinfandel from their perspective: terroir. Why terroir and not, say, varietal character? It is true that "terroir" has become one of those wine terms that most people, including wine profession- als, have trouble distinguishing in the actual taste of wines; and so the most convenient thing to do is deny that terroir-related distinctions exist, or that they matter. Especially when it comes to wines like Zinfandel, which often taste so strongly of the grape that sensations derived from geographic origins become neither here nor there. 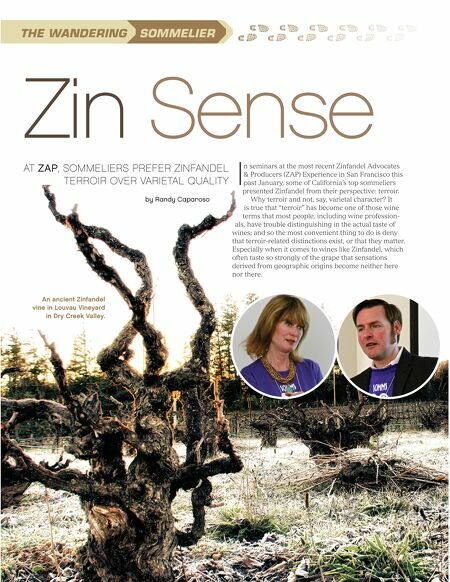 AT ZAP, SOMMELIERS PREFER ZINFANDEL TERROIR OVER VARIETAL QUALITY by Randy Caparoso An ancient Zinfandel vine in Louvau Vineyard in Dry Creek Valley.